The Class of 2016 may only just be graduating but as in past years, the College is asking its seniors donate to the senior class gift. As of press time, 28 percent of the class has contributed to the fund, raising around $13,018. In total, the gift has raised $31,604, when including the Class of 1966, underclassmen, staff and others’ contributions.Seniors have until June 30, the end of Dartmouth’s fiscal year, to donate. For the past 20 years, participation rates have been in the range of 65 to 75 percent, senior class gift co-chair David Cordero ’16 said. The College has recently seen some decline in participation rates, admittedly from extremely high rates of participation. For instance, the Class of 2010 boasted a 99.9 percent participation rate as all but one student donated. Since this peak in 2010, participation has declined over the following five years. The Class of 2015 had a participation rate of 61 percent, down 1 percent from the Class of 2014’s participation rate and 9 percent down from the Class of 2013’s participation rate. In 2012, the graduating class reached an 80 percent mark. From 2007 to 2015, the average participation rate was 82.5 percent. Cordero said that this year with the ’16s, the College hopes to get roughly 50 percent participation. Last year, the Class of 2015 raised $20,143.30 in contributions and when totaled with the alumni gifts from the Class of 1965, the gifts equaled $85,830.90. The campaign includes four co-chairs as well as 44 senior volunteers who typically help reach out to 30 to 45 friends to tell them about the senior class gift. “It ultimately makes it personal to have a conversation with someone you know,” he said. The funds raised go toward financial aid for the incoming Class of 2020, said Jeff Hafner ’02, Dartmouth College Fund senior class gift managing director. Cordero noted that this year students publically chose to not donate, and as a consequence, the campaign is expecting a lower participation rate than previous years. Much of the dissatisfaction with the College stems from the perception that administrators are not listening to student concerns. Leehi Yona ’16 echoed these sentiments in an email. Yona, a co-founder of Divest Dartmouth, wrote that she would not be donating to the senior class gift until the College responded to student concerns including those about fossil fuel divestment, issues about low rates of faculty of color and high rates of sexual assault. Instead, Yona stated that she was donating to the College through the Multi-School Divestment Fund, which will only give money to Dartmouth once it divests from fossil fuels. Bryan Thomson ’16 wrote a column published in The Dartmouth explaining why he would not be donating to the class gift. In the column, Thomson stated that he had struggled to justify a single major policy decision made by the College in his time here. Thomson specifically criticized the hard alcohol ban, undergraduate advisor and Safety and Security walkthroughs to monitor dorm activities, increasing regulations of Greek life, the end of the acceptance of advanced placement credits, and the change to reinstate need-aware admission for international students. Nonetheless, both Yona and Thomson noted that they were recipients of financial aid. In Thomson’s column he also said he had benefited from aspects of the College including flexible off-terms, renowned professors and a diverse student body, but added that he believed these elements had suffered in his time at the College for various reasons. Yona said that her fellow classmates also cited the lack of an inclusive community for people of color and a disregard for sexual assault victims. According to Yona, students also cited the level of administrative bureaucracy, which was a similar concern of Thomson’s. 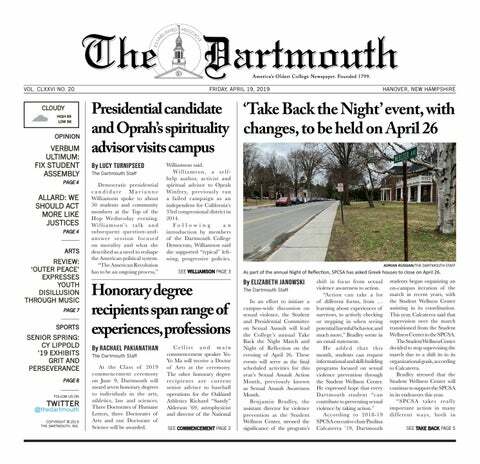 While Cordero admitted that his Dartmouth experience had not been perfect, he decided to lead the class gift campaign because of his overall positive experience at the College. A study comparing alumni donation rates revealed high correlations of alumni giving with five measures based on students’ perceptions, including intellectual development as well as the ability to stay close with undergraduate friends. Of schools with more than 3,000 students, the study found the College placed second in the nation in average alumni giving percentage from 2008 to 2011, only behind Princeton University. In the 2015 fiscal year, Hafner reported Dartmouth had the fifth highest participation rate in the Ivy League for the senior class gift behind Princeton, Yale University, Harvard College and the University of Pennsylvania. However, earlier this year The Yale Daily News also reported drops in its senior class gift participation from 78.1 percent in 2015 to 72.6 percent in 2016. The campaign urges seniors to donate the symbolic figure of $20.16 but accepts donations as small as a dollar. The fund offers an incentive for those who give $20.16 or more by inviting those who do so to a Homecoming brunch during the fall term following their graduation. Some have already made their gifts in honor of Dartmouth community members such as faculty, staff, classmates and in memoriam to community members who have died in recent years, including Summer Hammond ’17 and Tate Ramsden ’17. In addition, the class that graduated 50 years before the current graduating class customarily matches funds for the senior class gift. This year, the Class of 1966 has agreed to give $66 dollars for each senior who donates to the class gift. The senior class gift is part of the Dartmouth College Fund, the College’s annual fund, which is distinct from the endowment. Gifts made to the fund are used primarily toward the College’s financial aid sources but can also be used to support athletics, arts opportunities and competitive salaries for professors. In the 2014-2015 academic year, $41.4 million from the DCF comprised 41 percent of Dartmouth’s financial aid sources while the College’s endowed scholarship funds comprised 39 percent with $38.6 million. “You can think about the Dartmouth College Fund as the College’s checking account, whereas the endowment is more like a saving account,” Hafner said. Dartmouth’s endowment is much larger than the DCF, but the College only spends about 5 percent of the endowment each year as an attempt to ensure that the returns on the endowment exceed the amount taken from it. Last year, Dartmouth reported an 8.3 percent return on its endowment for the 2015 fiscal year. The endowment is also restricted in that much of it is spent on financially supporting the operations of the College’s undergraduate programs, the Geisel School of Medicine, the Thayer School of Engineering and the Tuck School of Business. While the Divest Dartmouth campaign pushes for the College to avoid spending its endowment on energy from fossil fuels, the donations from the senior class are separate from the endowment. When asked about this distinction, Yona maintained that the College’s investments make a statement about the kind of future Dartmouth wants for its students. More specifically, Yona wrote, the lack of divestment indicates that Dartmouth doesn’t envision a future for its students in a livable planet. In his column, Thomson wrote that donating to the class gift frees up more of the College’s money to spend on superficial fixes to Dartmouth’s problems. In an email statement, Thomson wrote that many of his friends had been receptive to his argument and were also planning on not donating. If most ’16s feel similarly to Thomson and decide not to participate in the senior class gift, this year’s seniors will be making a statement about whether or not students feel they received their own return on their four-year investment from Dartmouth.